Garry May vowed to "do everything I possibly can to bring Charles Wright back as a Rebel in 2019" after the Stockport skidder had contributed paid 12 to the Rebels cause in the first leg of the SGB Premiership Knockout Cup final tie against King's Lynn. Earlier in the season Wright was dropped by the Somerset side after a pit-side disagreement but with the Rebels needing cover for the injured Bradley Wilson-Dean, May offered Wright a guest appearance and the rider, who is just 9 days shy of his 30th birthday delighted the home fans with a gutsy performance, unbeaten in the four rides he completed whilst also suffering an horror-looking crash when taking the rider replacement ride in heat 8. As he went for a wide sweep round the first turn he was squeezed right out by Stars' Erik Riss, and flew off the bike over the top and landing heavily on the track, feeling his shoulder 'pop out' before correcting itself. Whilst he was pulled out of his scheduled next outing (the very next race), Wright battled on to make appearances in heats 12 and 15 combining respectively with Nico Covatti and Jason Doyle for two massive 5-1 heat advantages that resulted in a 16 point first leg advantage. Besides Wright's heroics, the Rebels were heavily reliant, for the second successive meeting, on the support from reserves Covatti and Jake Allen. Neither disappointed and collectively scored 20 paid 24 as the Rebels repelled a mid-meeting recovery from the visitors who were able to reduce a double digit deficit down to just four points after 11 heats. 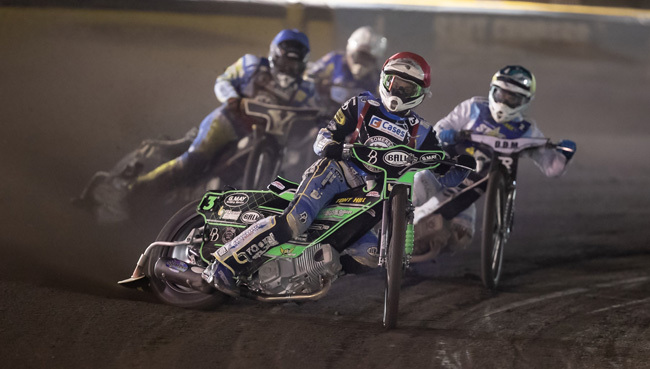 But the Rebels dropped just two points from the final four heats which included a superb ride from their other guest, Chris Harris, who unlike Wright will appear in both legs of the cup final. 'Bomber' showed true class as he hounded and passed Niels-Kristian Iversen - a rider with an impeccable record around the Oaktree in heat 13, securing the win simultaneously with Jason Doyle shrugging off the interests of Robert Lambert, whom by his own formidable standards this season had something of a below par performance from the Stars, scoring just four points from five outings. Speaking of the first leg lead, Garry May admitted "well it was much better in the end than it had looked at one stage. We know it is going to be ultra-tough up there tomorrow (Thursday) as they are very strong indeed at home, but we stuck to the task and I can't have any complaints. We spoke beforehand about the reserves being crucial and Jake and Nico responded superbly. We saw again what Bomber is capable of and as for Charles, well he promised me that he wouldn't let me down and he certainly lived up to his word. Just hearing the crowd tonight every time Wrighty came out on track demonstrated just how popular a guy he is around these parts and whilst we don't know anything at this stage about team strengths and stuff for 2019 I can assure Somerset fans that I will do everything in my power to try and bring him back here next season." The Rebels travel to the Adrian Flux Arena on Thursday for the concluding leg with Paul Starke guesting along with Chris Harris whilst King's Lynn remain unchanged.